In the near future the day had come for the big showdown between the two best soccer teams in the nation. A wide television audience was expected in addition to the large crowd that had already assembled at the stadium. As the teams took the field an uneasy feeling fell over the crowd. Suddenly, bursts of fire pelted the stadium and the field was engulfed in smoke. The crowd gazed in amazement as the smoke cleared to reveal that the players had been replaced by highly familiar robots running out onto the field. It seemed the robots were going to play the game instead. The television audience was especially surprised at the events. The most surprised person was the one and only Dr. Light, who immediately recognized the robots and knew Dr. Wily had to be up to his old tricks. This is unexpected, Dr. Light thought. That's probably what Dr. Wily is thinking: no one will notice when my robots take control of the world through its most popular sport. Think again Dr. Wily, here comes MEGA MAN! Dr. Light brought to life a reserve of blue crime-fighting robots with the trusty Mega Man leading them. The next great robot showdown will be on the soccer field. No matter where Dr. Wily's diabolical plots occur Mega Man will be there to battle through the robots and get Dr. Wily. --From the SNES Mega Man Soccer instruction manual. Play Mega Man Soccer Now! Pick a team, set up the positions, and save the world through soccer. The graphics and gameplay are really good, and any Mega Man fan should check this game out. 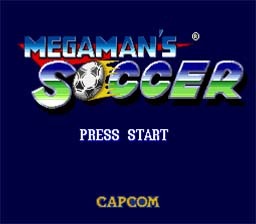 Mega Man Soccer, the first and only classic Mega Man sports game. This game is pretty cool if you are by yourself or with a friend. First you pick the players that best suit your playing style, then you choose the layout of the players on the field, and finally you play soccer like it has never been played before. Each player has a special kick that is very cool and really handy. Get along the wall just below your opponent's goal. If a kick is made close enough, the opposing goalie will not be able to catch the ball.